The Upper East Side has been getting a (behind-the-)face-lift, thanks to the ingenuity of developer Daniel E Straus. In 2010, Straus bought six brownstones in the historic district from the Whitney Museum for $95 million. The Whitney had acquired the buildings over the decades, planning on expanding the museum, but only partitioning the landmark buildings into a maze of offices. Several plans to develop the sites were voted down by the Landmarks Preservation Commission, and others just never came to fruition under the Whitney. After a few plans were returned to Straus with notes, he decided to leave the historic flavor of the block intact, and build an entirely new living space behind it. 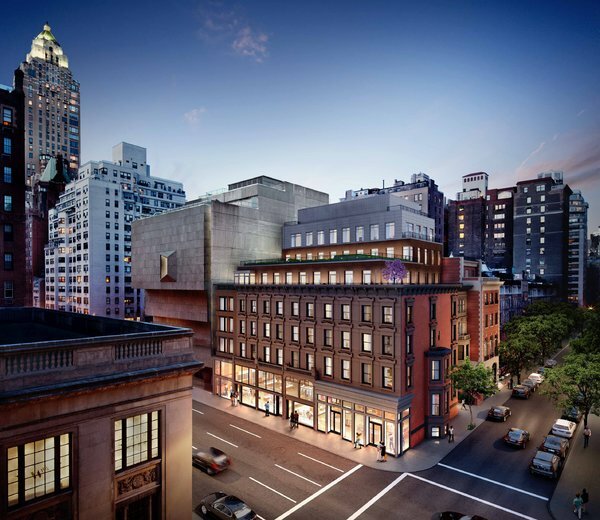 Beneath the late 19th century façade, 21st century architecture and interior design will provide enormous, beautiful residences, and 15,000 square feet of retail space on the ground floor, including 100 feet of Madison Avenue frontage. Retail space on Madison Avenue fetches a pretty penny. As reported by The Real Deal, Thor Equities recently purchased 33,389 square feet of retail space at 680 Madison for $277 million. Location and look may not prepare the viewer for what’s inside, however. Each condo will stretch the length of three brownstones, with two units per floor, bringing the square footage of the three bedroom residences to 3,900. On top of the building, a 100 foot terrace will set back a 5,400 square foot penthouse. A smaller terrace duplex will top the penthouse. Preservationist Design company Beyer Blinder Belle, whose past projects include The Lincoln Center Promenade, Ellis Island, and the restoration of the Grand Central Terminal, to name a very few, was brought on board early in the project. According to the New York Daily News, Straus also hired Champalimaud, the interior design firm that has been awarded for its outstanding work, which includes the Pierre, the Carlyle and the new lobby of the Waldorf Astoria. The commanding prices and high aspirations towards both modern innovation and historical preservation are a far cry from the outlook of the estate when it was purchased, though. In a New York Times article penned by Ronda Kaysen, Straus stated, “I would love to take credit for brilliance, but I think it’s really fortuitous.” When the Whitney sold the properties, the museum already had plans to move downtown, and was closing in on a deal for a property near the High Line park, but they had yet to find a new tenant for the brutalist Breuer building next to the Brownstones. Now the Metropolitan Museum of Art will be taking over the building, extending their popular contemporary art exhibit, as well as other collections, to this new location. If even ten percent of the more than six million visitors to the Met make the walk to the Breuer, foot traffic to the building will double, not to mention what it will do for the traffic to all that new retail space. This kind of lucky place and timing, mixed with professional savvy to hire those who know what they are doing, has been a benchmark of Straus’ success, and subsequent philanthropy. Straus took over his father’s nursing home business after the patriarch’s death. He grew the business into a post-acute network of more than 50 skilled nursing and assisted living facilities. He eventually sold this business for one billion dollars. An accredited lawyer, he then joined the board of the law school at NYU, where he would later donate a large portion of the funds for The Straus Institute for the Advanced Study of Law and Justice. The institute, named for Daniel Straus’ father and mother, is dedicated to an “international, multicultural, interdisciplinary, and community-minded approach,” according to their mission statement. With this, his first development project in New York, we see that Straus is able to keep that community and culture-minded approach to his work in real estate, giving visitors to the new Met location even more to love about the UES.